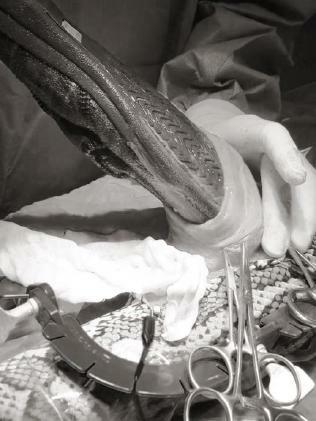 A SNAKE that swallowed a slipper has been saved by a Queensland vet. 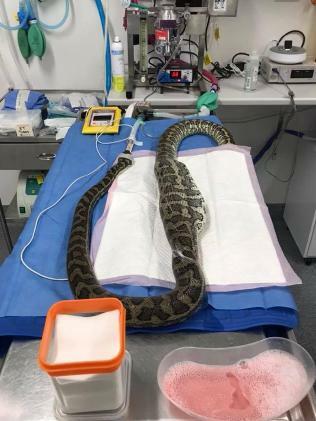 Josh Llinas from Greencross Vets performed surgery for more than an hour on the 2m-long coast carpet python, extracting the slipper via a 45cm incision. 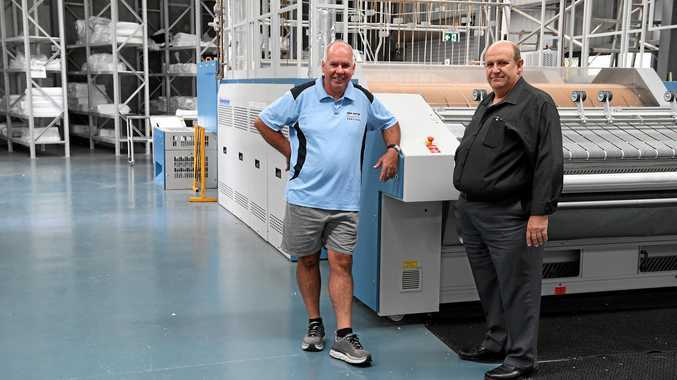 "I decided it was one that was going to come out manually," Mr Llinas told The Courier-Mail. "Sometimes you can remove the foreign bodies by helping them after they've been relaxed … by helping them move it up the digestive tract and out of the mouth. "This was just way too big and it wasn't going to come out," he said. 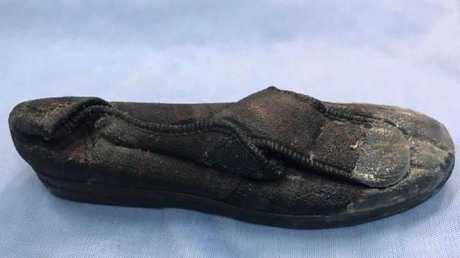 Mr Llinas performed a procedure called a "coeliotomy and gastrotomy" at the Mount Ommaney clinic to remove the slipper from inside the snake before closing its stomach in two layers, the muscle wall and then the skin. 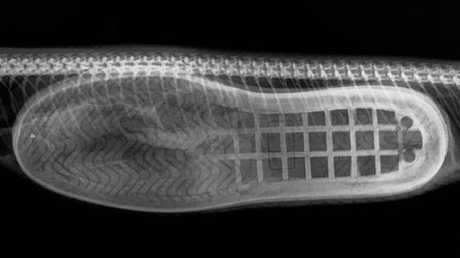 He said even before X-ray images were taken, it was clear that the foreign object was a slipper. Vet Josh Llinas removes the slipper. 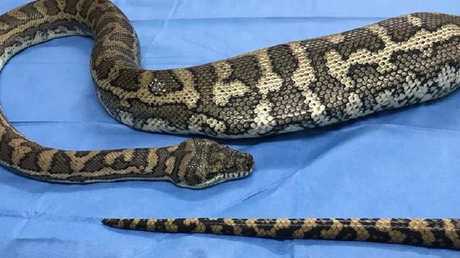 "A local snake catcher brought the snake into the clinic, so I don't know the ­details of the gentleman who brought it in," he said. "They knew it had eaten a slipper because they saw (the snake) in the room with one slipper missing. "You could see the outline of some foreign material in the stomach." The offending slipper after it was removed at Greencross Vets. Mr Llinas said the snake, which will spend the next six to eight weeks in recovery, appeared unscathed by the experience. "There was no damage that I could see," he said. Despite describing the X-ray as "the most impressive radiographs I have ever seen", Mr Llinas said it was a "pretty straightforward" surgery. 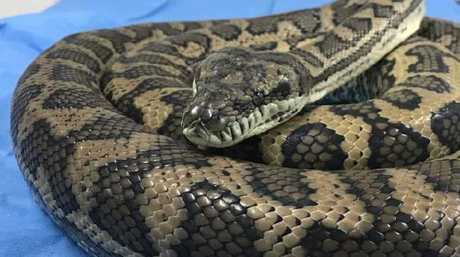 The lucky carpet python will now spend the next couple of months recovering from its operation. "In the last couple of months, I've had quite a few foreign bodies removed from snakes," he said. "I had a pillow case removed from a black-headed python, and just a few months ago, I had a tennis ball removed from a snake. "This was probably one of the more unusual things I've removed. I've heard of others swallowing thongs, stuffed toys. You name it, they will eat it." The snake on the operating table.